Ways to Trick Guests into Thinking Your Home Has More Space! Not everyone is lucky enough to own a large property, especially homeowners here in the metro Washington, DC area. Townhomes are all the rage, property values are higher than average, and space is hard to come by. That’s why it’s important to pick up little tricks to open up smaller spaces. Creating the illusion of more space doesn’t have to be expensive. Here are a few things you can do. 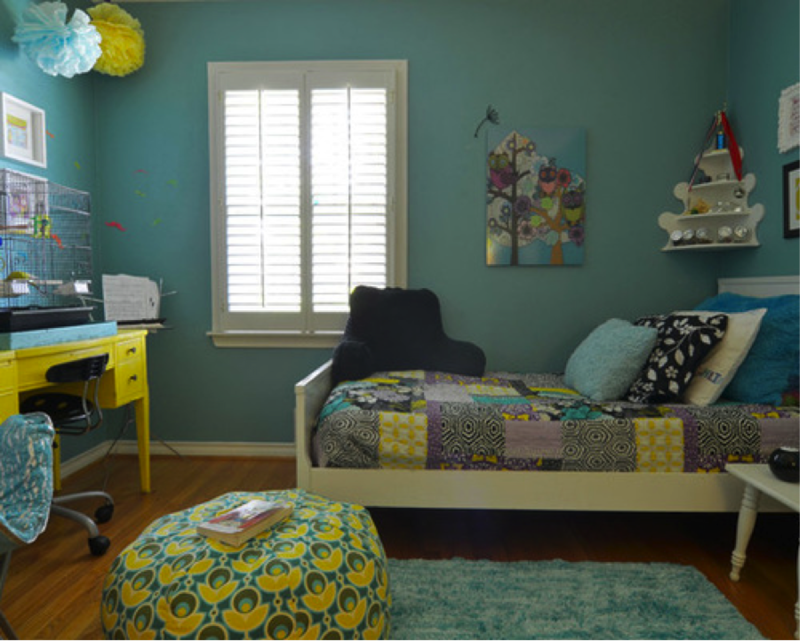 Light colors: Bold colors will dominate a room and make it feel smaller than it really is. Choose neutral, light colors to create the opposite effect. Avoid busy wallpaper or too many knick knacks or picture frames, as this also tightens space up. Don’t line all the walls with stuff: If furniture lines every wall space, it automatically makes the room feel stuffy and full. Choose carefully when placing furniture, and sometimes the best thing to do is simply get rid of a piece that serves no real purpose. Mirrors and glass: Bathrooms are a great room to utilize glass in; choose clear glass shower doors instead of colored or opaque. Narrow hallways will appear open with tactfully placed mirrors. Natural sunlight: Draw back those curtains, open those blinds, and let that sun in! Natural sunlight is not only good for your mood, but it’ll also help create an easy openness in a space that may be a little small. 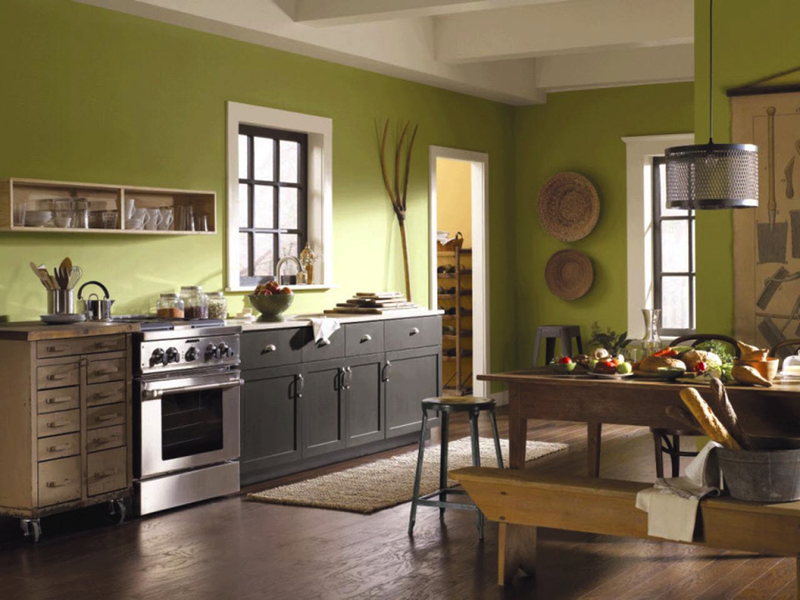 For more information about appropriate paint colors for your space, call Ploutis Contracting today: (703) 360-0205. The colder seasons can cause one to become restless, as much time is spent stuck indoors with nothing to do. This is a time when home project ideas begin formulating, and what better place to start than refreshing your wall colors? The problems arise when we find ourselves trapped amongst paint odors, though, because windows are sealed shut to keep out the cold. How do homeowners protect themselves from breathing in harsh chemicals? Here are a few options. A relatively new concept, Paint Scentsations are additives that go directly into your paint to create a pleasant alternative to the harsh scent of paint. While it doesn’t eliminate VOC’s (Volatile Organic Compounds), it does mask what is otherwise a very powerfully jarring scent. To avoid VOC’s that are present in the solvent – those are what gives paint that uniquely chemical smell – buy environmentally conscious low or zero-VOC paint. The formulas have been perfected to be green (good for the Earth, woohoo!) and with a gentler scent. Leave the hard work to the professionals and spend a night out with the family while your home gets revamped. Many times, homeowners choose to take a break and get away, and use this time to hire painters for interior painting services. By the time you return, the fumes will have died down tremendously, reducing the hazardous inhalants in the air. For more information about painting and other contracting services, visit Ploutis Contracting online or by calling (703) 360-0205. Rot happens, even to the most well maintained houses. All you need is a combination of wood, water, and warmth, and your prized lumber begins turning to a soft, crumbling mush. Exterior trim is the most vulnerable to attack by rot fungi, and it doesn’t have to be very old; the trim shown below was installed around 12 years ago. Before your local contractor fixes it, they’ll have to perform a comprehensive inspection to find all of it. With screwdriver or awl in hand, they’ll scrutinize areas that are nearly horizontal and don’t drain well, such as windowsills, drip caps, and water tables. A tip we always give: look for paint that is cracked, peeling, or blistering, or wood that’s darker than the surrounding area or green with algae. We probe anywhere there’s end grain and we pay particular attention to joints, which dry slowly, and to all wood that’s close to dirt, concrete, or masonry. A super easy rotting wood fix is replacing it with PVC, which doesn’t ever rot. Definitely worth the investment! If you’re finding problem areas this spring, call your favorite local contractors to get the inspection process started! Ploutis Painting & Contracting is family owned and operated. For over 50 years, we have worked meticulously to develop reliable and professional methods to ensure guaranteed customer satisfaction. We have set the standard for the industry by providing the highest quality interior and exterior painting to commercial buildings, condominiums and residential properties within the Maryland, Virginia and Washington, DC area. We are praised for our consistent dedication and excellence in our work and strive to provide nothing short of perfection. Home decks are the perfect place for entertaining. Unfortunately, as they age, things like weather damage and general wear and tear can cause their structure to deteriorate and become unstable— especially if they were built improperly. If your deck was built over 10 years ago, here are some things to look for that may indicate it’s in need of some rehab and repair. The four elements that provide vital reinforcement to your deck’s structure are: wood, nails, screws, and sturdy metal connectors. If you inspect your deck and see only wood and nails (which could be the result of either improper building/design or a lack of maintenance), your deck may be unsafe. After years of use, your deck will suffer wear and tear. Even if you know you have the proper connections in place, depending on how your deck was built, those connections may have loosened or deteriorated over time, which compromises your deck’s strength and sturdiness. Symptoms of loose or corroded connections include wobbly rails, loose stair steps and ledgers (the boards attached directly to side of your house to support the deck) that look to be moving away from the home. In Washington, DC, the hot, humid summers create the perfect conditions for wood rot, which can compromise the integrity of your deck over time. Look along the boards and structural elements for any visible signs of rot, which include discoloration, mold, mildew and areas that are softer than others. Any deteriorated wood boards, beams and otherwise will need to be replaced as soon as possible to prevent spreading. Are any of these problems compromising the safety and integrity of your home deck? Contact Ploutis Painting & Contracting, Co. today and our expert team will come by to give your deck a professional evaluation. We have set the standard for the industry by providing the highest quality interior and exterior painting to commercial buildings, condominiums and residential properties within the Maryland, Virginia and Washington DC area. We are praised for our consistent dedication and excellence in our work and strive to provide nothing short of perfection. Snow blanketed the ground this month and we know the last thing homeowners want to think about is exterior siding work. However, now isn’t a bad time to begin considering your options and visiting showrooms to research the topic. 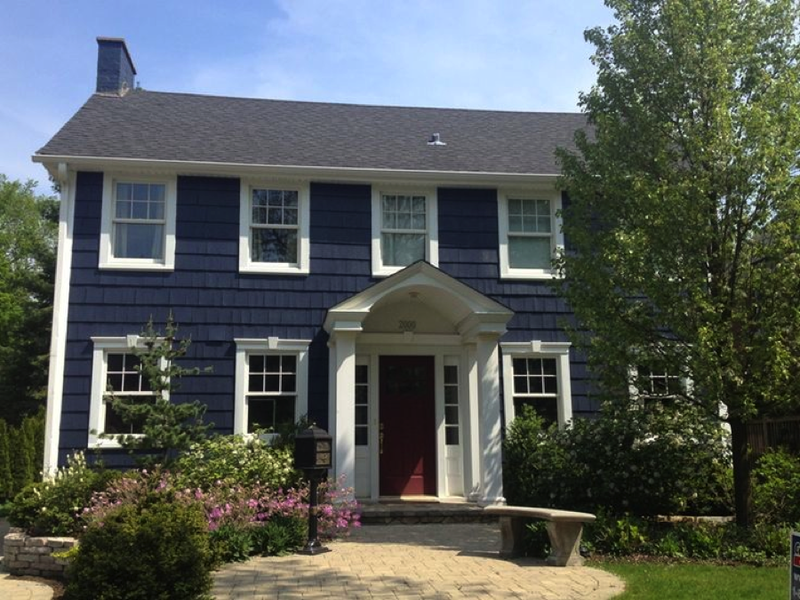 In this blog, we’ve compiled a short list of our siding services so that you’re aware of how we can help you refresh your home this spring. It’s time for a facelift! Did you know that siding is a great way to add color and definition to your house? There are a lot of vinyl options these days to help you create the perfect façade and we want you to choose carefully. While aesthetics are definitely important, you also want to consider the material’s durability, ability to resist water, ease of installation and versatility. Or, if your siding is doing A-OK, there are some other options to clean up your home’s look! The low cost, versatility and easy maintenance of vinyl siding has helped it become the most popular siding choice in the Northern Virginia area. While some design professionals and homeowners are turned off by the “plastic look” of some vinyl siding products, the variety of colors and styles available helps explain this siding’s popularity. Traditional stucco is made from building sand, cement, lime and water. A waterproof barrier paper and galvanized-metal screening are applied over wood walls before stucco is added to provide a good base for the stucco and protect the walls underneath. While stucco can be applied to homes with brick and stone surfaces, the classic look is commonly found on Mediterranean, ranch and Spanish-mission exteriors. We are experienced in a variety of stucco repairs. Old Man Winter probably won’t leave your home exterior the way you left it last fall. From dirt to bird droppings to general grime, many homeowners choose pressure washing as a cost-effective alternative to update the look of their home. However, please heed our warning: if you don’t know what you’re doing, you can damage your siding by blowing a hole through it. We’ve seen it happen before. Please consider hiring a licensed, professional contractor (like ourselves!) to save you the additional expenses of destroyed siding. If you’re in the DC, VA, or MD area, we’d love to help you find the best vinyl option for your home or condo. Contact us today for a consultation: (703) 360-0205. Stay warm! Sometimes the best motivation for initiating home upgrades is when you know guests are coming to stay with you. That’s when you start seeing your home through their eyes and realize it’s time to declutter, decorate, and clean. Here are a few tips to wow your family and friends this holiday season. This is likely to be the first room in the house to suffer an aesthetic beating due to its high traffic of dirty boots and moisture. Dedicate a weekend to giving it a fresh coat of paint and a good cleaning. To store shoes, we suggest creating an enclosed shelving unit that hides that clutter. Bright white caulking can make your bathroom look like it was just renovated. Remove existing caulking with a sharp tool, clean the surface to remove all traces of the previous work, dry the area, and then carefully begin. For best results, allow caulk to dry for at least 24 hours. Depending on the weather, this is a great way to refresh your driveway/sidewalk, siding, and deck. Not only can pressure washing delay future projects such as painting or installing siding, but it also greatly improves the appearance of your home. It’s important to keep in mind, though, that hiring an experienced professional is almost always worth the extra cost. If you’d like a quote for one of these services, please contact us by calling (703) 360-0205 or by emailing info@ploutiscontracting.com. From all of us at Ploutis Painting & Contracting, we wish you a wonderful holiday season full of love, happiness, and new adventures! Ploutis Painting & Contracting is family owned and operated. For over 50 years, we have worked meticulously to develop reliable and professional methods to ensure guaranteed customer satisfaction. We have set the standard for the industry by providing the highest quality interior and exterior painting to commercial buildings, condominiums and residential properties within the Maryland, Virginia and DC area. We are praised for our consistent dedication and excellence in our work and strive to provide nothing short of perfection. Now that the days are becoming shorter and winter is around the corner, taking care of small problems around the house before they become big, costly repairs will be well worth the effort. So with pencil and pad in hand, tour the exterior of your house and jot down the things you see that should be done before our sunny Northern Virginia days turn cooler. You’ll be amazed how a bit of TLC recaptures the original beauty and solid construction of your Home Sweet Home. • Get your mind in the gutters. Inspect and clean gutters and downspouts. • Button up your overcoat. Seal gaps and cracks around windows and doors with weather-stripping and caulk. • Get on top of roof problems. Inspect your roof for damaged or curled shingles, corroded flashing, or leaky vents. • Walks the walks (and drives). Take steps to repair damaged sidewalks, driveways, and steps. • Chill out. Drain and winterize outdoor faucets and irrigation systems. • Freshen your filter. Clean or replace dirty furnace filters. • Give your furnace a physical. Have a professional inspect your heating system. • Gather round the hearth. Check fireplaces for soot or creosote build-up. Better yet, schedule a visit from a reputable chimney sweep. • Keep the humidifier humming. Clean the plates or pads to ensure efficient operation. • Head-off gas problems. If you have a gas-fired room heater, have it inspected by a pro. Also, perform any routine maintenance recommended by the maker. • Keep the wood fires burning brightly. Wood stoves are making a comeback. To avoid a deadly situation, be sure to inspect yours before firing it up. • Keep your family safe at home. A home safety check should be an annual ritual in every household. Test smoke and CO monitors, inspect (or install) fire extinguishers, review fire escape plans, and rid your home of old newspapers and other fire hazards. For more information about Ploutis Painting & Contracting or to receive a complimentary estimate, please call us at (703) 360-0205 today. Ploutis Painting & Contracting is family owned and operated. For over 50 years, we have worked meticulously to develop reliable and professional methods to ensure guaranteed customer satisfaction. We have set the standard for the industry by providing the highest quality interior and exterior painting to commercial buildings, condominiums and residential properties within the Maryland, Virginia and Washington DC area. We are praised for our consistent dedication and excellence in our work and strive to provide nothing short of perfection. There’s a nice surprise and a welcomed relief for today’s homeowners: longer-lasting exterior paints! If you haven’t heard, almost all paints have been reformulated in the last 10 years with evolved paint technologies to deliver color-rich and exceedingly fade-resistant finishes. The need for frequent exterior painting is now considered “old school,” no matter where you happen to live in Northern Virginia. 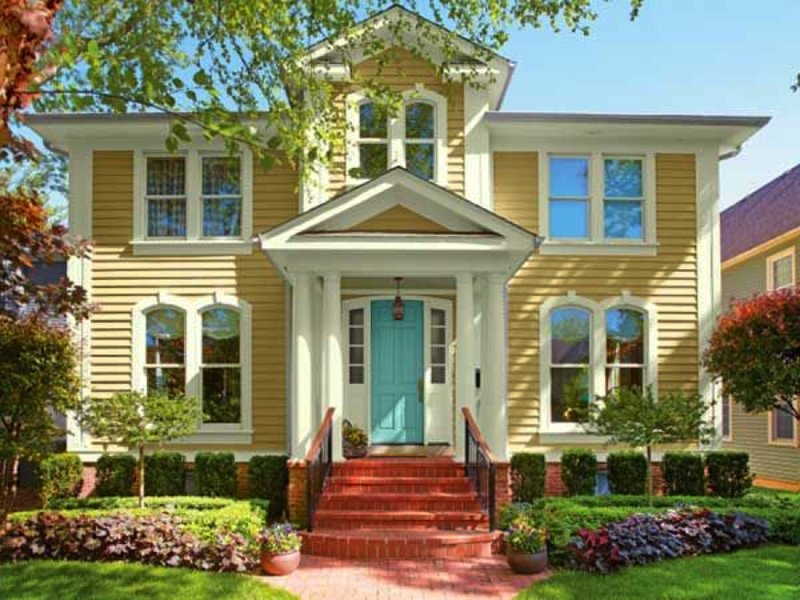 What hasn’t become old school, however, is the resulting color fatigue among homeowners who yearn for a fresh makeover, but have trouble justifying the whole-house painting cost. If this sounds like you, here are some astoundingly simple, picture-perfect, yet low-cost solutions to perk up your home’s appearance. Spring forward this season by adding bright colors to the interior or exterior of your home. The new trends for Spring, 2016 pull inspiration from nature. The palette moves away from softer, neutral colors to brighter, vibrant shades that are reminiscent of tropical island life. You’ll find that these hues are bold, unique and refreshing. Perfect for homes with young children, modern décor, or natural wood accents. We have set the standard for the industry by providing the highest quality interior and exterior painting to commercial buildings, condominiums and residential properties within the Maryland, Virgina and Washington DC area. We are praised for our consistent dedication and excellence in our work and strive to provide nothing short of perfection. 5. Use PVC to replace wood. In many cases, PVC (a thermoplastic) is a great replacement for chipped trim pieces and wood rot. ​Unlike wood, it never rots and most people don’t even notice an aesthetic difference between the two. We use brands such as Royal and Azek, and highly recommend the two. After the wood is replaced just about any 100% acrylic latex paint or 100% acrylic latex with a urethane additive paint can be used to achieve superior coating durability and flexibility. Start on top to prevent streaks, concentrating on your ceilings first. Paint the ceiling with a roller and extension handle, and paint the edges with a brush, creating a border about 2″ to 3″ wide. Then continue to the walls, working your way down. Compared with average-grade interior paints, top quality finishes are much easier to work with and offer superior long-term performance. Top quality paints won’t spatter or show obvious brush marks (we all know those are the worst). And since they hide better than ordinary paints, a single coat is often sufficient to give a great looking paint job and save on time, labor and cost. Because top quality interior paints also are tougher and more durable than ordinary interior paints, they resist fading, yellowing and staining. Here at Ploutis Painting & Contracting, we recommend the brands Duration and Superpaint, which are medium- to high-grade levels. This may seem like a joke, but we can’t stress enough how often we see defeated DIY customers who forgot the primer. There’s a reason it’s called primer. For better paint adhesion, priming is the way to go. Use an oil primer and top it off with latex or acrylic for a better seal. And last but not least, don’t forget about environmental factors! Although summer in the Northern Virginia, DC, MD area is an ideal time for exterior painting, Autumn is a great time to paint too. Paint needs time to cure, so rain is its biggest enemy. Moisture in the air keeps water-based paint from drying, so watch your weather forecast for dry days to prevent it from blistering or bubbling. For more information about Ploutis Painting & Contracting or to receive a complimentary estimate, please call them at (703) 360-0205 today.